This is the big birthday month in our two families. Bob's brothers Ed and Larry Goodrich, his granddaughter JayLynn Elliott, my sister Dody Gage and my son Jack Glover who hits 50 on the 20th. Happy Birthday to all of them. I remember the day Dody was born. Dad took me up the road to Brewers to get on the school bus that morning. I was 6 and in first grade. When I came home from school Mrs. Aylesworth, a neighbor who lived up the road, was there and showed me Dody sleeping. Wonder how she got there? When Dody was one I invited the neighbor kids for a birthday party. When Mom found out she baked a cake and went to the store for ice cream. Dody was the only one of us to have curly hair. Today I've been sewing the piano key border for the Nickel Brick quilt. I have both borders on it on one side. It looks good. Bonnie Hunter was right. "When you come across something you don't really like but can't quite toss out, my rule of thumb is to cut it as narrow as possible--1 1/2" is good. If it's still ugly, you haven't cut it small enough!" (page 29, Quiltmaker Jan/Feb '09) Some of my fabrics were ugly but look good with the other colors used. 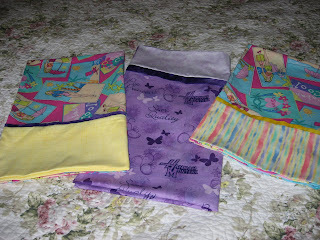 I do enjoy Bonnie Hunter's site and her blog Quiltville's Quips & Snips!! She has some great information for quilters and insights into her life. Have a great week quilting!